TRIANGLE Filtration has released a range of hydraulic control valves suitable for water applications. 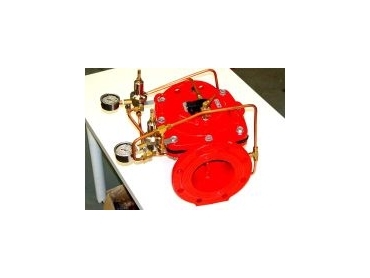 The range includes cast iron globe pattern valves up to 250mm, and 90° angle valves up to 100mm pipe sizes. The valve opens, closes and regulates via a flexible rubber diaphragm inside the valve. The position of the diaphragm is controlled by the volume of water in the control chamber on top of the valve. Pilots fitted to the valve can be plumbed to configure the valve for the function required. Functions the valve can be used for include: pressure reducing, pressure relief, pressure sustaining and electric remote valve applications. The valves are rated up to an operating pressure of PN16 (16 bar). Typical applications include mining, dust suppression, building services, municipal, pipeline protection, pumping stations and irrigation.